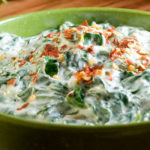 A classic spinach dip contains lots of ingredients that are good for you; it’s the few ingredients that aren’t good for you that’ll throw your healthy eating plan off the rails. We created a healthier version of the classic spinach dip, with only 32 calories per serving. Eat this savory spinach dip with raw veggies like carrots, celery sticks, radishes, or sliced bell peppers. This delicious, healthier features baby spinach, freshly squeezed lemon juice, finely chopped garlic, and reduced-fat Greek yogurt. Place spinach in colander; drain of all excess water. Finely chop spinach; place in a medium bowl. Add yogurt, garlic, green onions, and lemon juice; mix well. Season with salt and pepper (if desired). A great veggie snack(tional) with a little bit of bonus protein.